Looking for baby clothes ? With over 60 years of experience, Brums still has the same love for designing and making clothes for 0-2 year olds today as it did back then. Brums is by your side as your children grow, with clothing for newborns right up to toddlers. 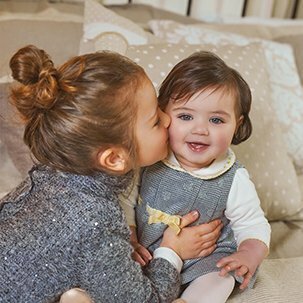 Our babygrow, bodysuit, shoe, outfit, sleep bag, bib, pyjama and layette designs ensure comfort, practicality and are gentle on skin. Discover our wide election of Brums brand baby clothing in this section. Each garment in the collection is created with special attention to detail and finishes such as fastenings and collars, and uses the safest materials and fabrics.